Rejuvenate your independence with a small and easy to use travel mobility scooter. The ST1 travel mobility scooter is small enough to fit in the boot of a car, yet packed with features to make travelling from A to B a safe and enjoyable experience. When out and about, this portable mobility scooter will cover 6 miles per charge and cruise at speeds of up to 4mph. Comfort is provided by a cushioned seat, and adjustable armrests and handlebars enable the user to find their ideal driving position. 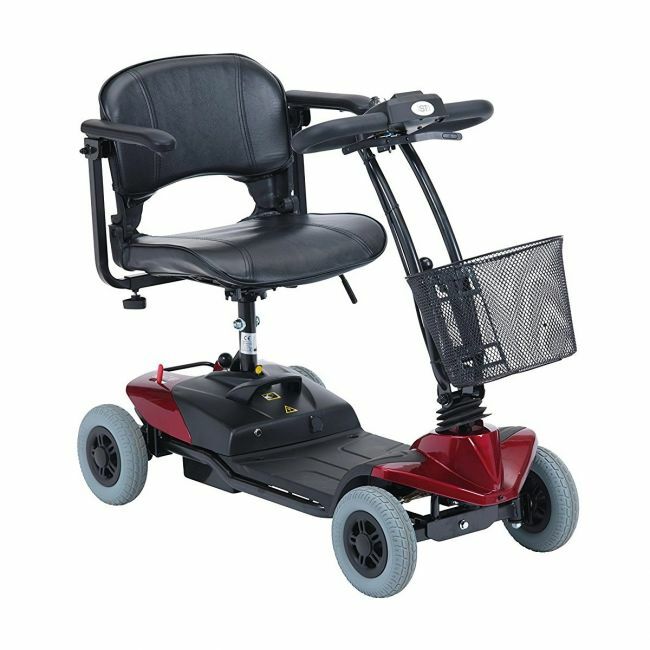 When not in use, the frame splits easily allowing the user to fold up the mobility scooter and store it safely using the lifting handle. Other features include a horn to alert others of your presence, a removable storage basket, puncture proof tyres, anti-tip wheels, and an off-board charging facility for charging the battery indoors. Available in Ruby Red or Sapphire Blue.